The latest reviewed version was checked on 18 November 2017. There are 3 pending changes awaiting review. The Korean alphabet, known commonly as ''Hangul'' in English but as ''Hangeul'' in the official standard Romanization rule (한글, "great script"), is considered one of the most efficient and logical writing systems in the world. While most modern alphabets evolved from earlier hieroglyphics or ideographs, 한글 (Hangeul) was created specifically to make it easy to read and write the Korean language. Although the characters of 한글 (Hangeul) may appear to be ideograms like the traditional Hanja (한자, 漢字), they really form an alphabet. 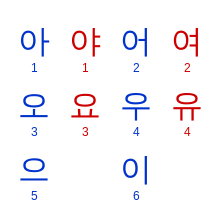 Each block character represents one syllable and is made up of individual jamo (자모), much like the letters in the Latin alphabet. 한글 (Hangeul) is easy to learn because it has only 24 basic jamo. See Wikipedia's entries on Hangul and Hanja for more about the history and design of the Korean writing systems. Notice that some consonants have two different pronunciations (e.g. ㄱ pronounced as /g/ or /k/ depending on context). Some of the alternative sounds in pronunciation of the basic consonant letters are their sound value as the final jamos when they are not altered by the initial jamo of the next syllabic character. ㅅ ㅈ ㅊ ㅎ has [t] sound as the final. Also, some are "aspirated" and some are "tense". Those details and more are explained in Essential Pronunciation Rules. There are 21 letters used to represent vowels: six basic vowels, nine combinations of those six basic vowels (which originally were all pronounced as diphthongs), and six vowels with an extra short dash representing the initial y [j] sound. To learn how to read, write, and pronounce each Korean letter, proceed to the Read, Write, and Pronounce Korean course. This page was last edited on 5 May 2018, at 12:09.